New lighting will be added to the iconic Iron Bridge when it reopens in the autumn following restoration work. Telford & Wrekin Council has appointed lighting design specialists LPA Lighting to design a new permanent lighting scheme to illuminate the bridge. It will be one of the legacy projects that form part of Telford’s 50th birthday celebrations. Councillor Rae Evans, Telford & Wrekin Council’s cabinet member for tourism, said: "I think everyone was delighted with how the Iron Bridge looked when it was lit up for the Night of Heritage Light. "So the opportunity to have a permanent lighting design installed as part of our Telford 50 celebrations is absolutely fantastic and definitely one that I welcome. LPA Lighting is a consultancy practice set up by designer Liz Peck, who has 18 years experience in the lighting industry – working for leading manufacturers. She was awarded 'Lux Person Of The Year' in 2015 and is closely involved with the Society of Light and Lighting. Liz will be working on the permanent lighting design with her colleague Bob Bohannon. They both deliver regular training courses at the Lighting Industry Association in Telford so have a personal attachment to the town. Liz said: "We are absolutely delighted to be appointed to re-light the historic Iron Bridge. 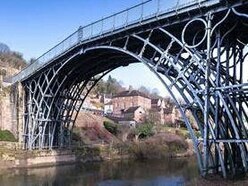 "To be associated with such a triumph of engineering and to bring a new legacy to the Ironbridge Gorge World Heritage Site is so exciting given its prestigious nature, particularly in harness with the extensive repair work currently being undertaken. "I led the Society of Light and Lighting’s Night Of Heritage Light project in 2015, when we lit nine UNESCO World Heritage sites across the UK – so to be able to light it permanently is amazing. LPA Lighting has already conducted a site inspection and are meeting with English Heritage this week. The charity has been carrying out the restoration work on the bridge.